If a bikini clad temptress does not emerge from the sea at a random moment in the film, the best bit of any James Bond movie is of course the habitual visit by 007 to Q Branch, where he is fully equipped for the battle ahead. This film is no different. But poor Q; the old boy is in a wheelchair with his leg in plaster. The plaster-cast fires off a rocket. It misses the sand bags aimed for, but although Q’s aim is a little off, he is still on great form. Then it’s off to see 007’s new car. The demonstration includes an emergency parachute breaking system to slow it down because unlike the recent Bond car it’s includes the sporty lines of the Aston Martin DB5. These cars are so impressive they don’t even bother telling us about the wizardry, these days. Although to be fair, it’s rather shoe-horned into the storyline because you only get to see it for a short period later in the film. 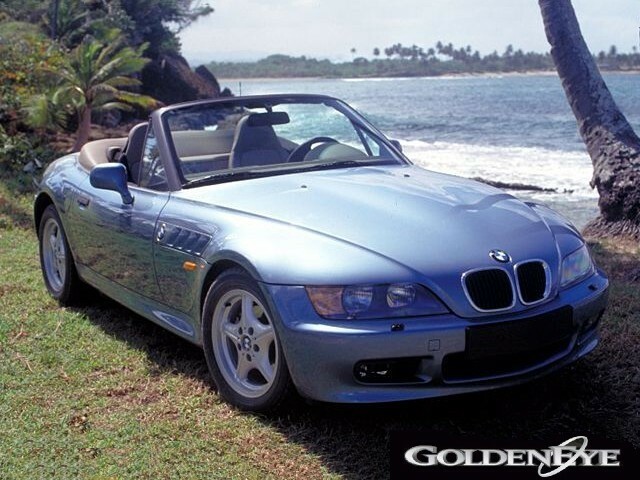 The car appeared months before its general release to the public, which was a massive marketing coup for BMW. A small number of a limited edition were released when the car was launched and these sold within hours. The model used was a 1.9 litre finished in Atlanta Blue with a beige interior. The original now lives at the James Bond 007 Museum in Nybro, Sweden.There are lots of Roadsters available throughout the huge quantity of dealers. The models from before the year 2000 can be bought for as little as £3000 for a very good condition model with under 50,000 mileage.